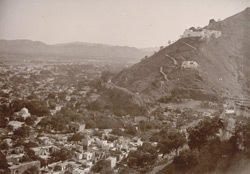 Photograph of Ajmer in Rajasthan, taken by Lala Deen Dayal in the 1880s, from the Curzon Collection: 'Views of places proposed to be visited by Their Excellencies Lord & Lady Curzon during Autumn Tour 1902'. Lord Curzon served as Viceroy of India between 1899 and 1905. The town of Ajmer was founded in 145 AD by Raja Ajaipal, a Chauhan Rajput king, and lies next to the Ana Sagar Lake at the foot of Taragarh Hill. It was ruled by various Hindu and Muslim dynasties until the Mughal emperor Akbar (r.1556-1605) annexed the town in 1556, making it an administrative centre of his empire and one of the royal residences. Ajmer was subsequently ruled by the house of Jodhpur and the Marathas before being annexed by the British in 1818, becoming the headquarters of the Agent General for Rajputana. This is a general view overlooking the town and distant hills from Taragarh Hill, which has a 12th century fort on the summit.